Today we took a big bundle of leaflets up to Seahouses, so that they are available for divers and non-divers to pick up on their travels. Everyone we spoke to was either aware of the project, or very interested in finding out more. So my tasks in the next few weeks are to get in touch with the AONB and to arrange giving some talks on the Gun Rocks Project. We did find out, while chatting to people, that Seahouses Pier has a couple of cracks in it, so these are being repaired over the next few months. This is going to mean no access or parking on the pier, and possible times when the slip may be rather busy with works traffic. As we like launching from Seahouses, and the situation with works is subject to change, we will keep in touch with the Harbour Master, to find out if we need to divert to Beadnell for launching or not. On Friday, the first of two funding reports were sent to our two main funding sources. The British Sub-aqua Jubilee Trust, who kindly donated £1000, were due the first report on our activities over the last 12 months. The second report is due at the end of April and is for the Heritage Lottery Fund. For all of the people who kindly donated through CrowdFunder, hopefully you are keeping up to date through this blog. In addition to this, we will also upload the funding report, so you can see what we have achieved so far….. all we need to do now is install the dive trail and work out the true origin of the wreck which deposited the cannon. Gun Rocks Marine Life Leaflets. 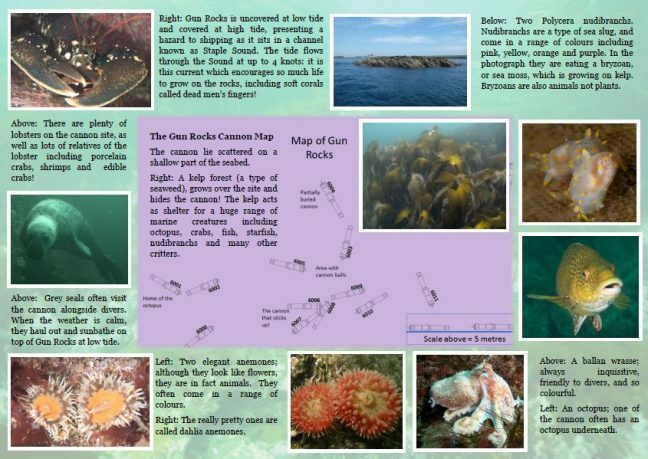 The Gun Rocks Marine Life Leaflet has now been printed and folded. All 500 arrived at my office today, so let’s hope there are no spelling mistakes! Links to download can be found on the Downloads page. For the marine life leaflet we have gone for a similar format to the archaeological leaflet, but have used a different livery, so it is east to distinguish. The idea of the marine life leaflet is to give divers and non-divers a snapshot of the life that is down there, rather than a comprehensive ID guide. As a result the leaflet contains no Latin names for the species, only common ones, and a range of coloured photos. The intention is also to raise awareness of Seasearch, so that if divers want to record what they see, they can do in a structured format. 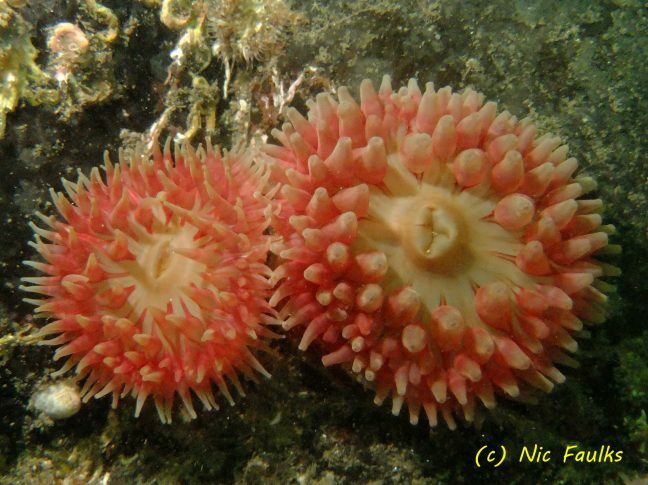 The records submitted through Seasearch are then uploaded on to the National Biodiversity Network (NBN), where they become accessible to everyone and can be used for conservation, or to further our understanding of the marine life in the UK. The Gun Rocks site is swept by a strong current on the ebb tide, the cannon are therefore covered in a range of marine life. 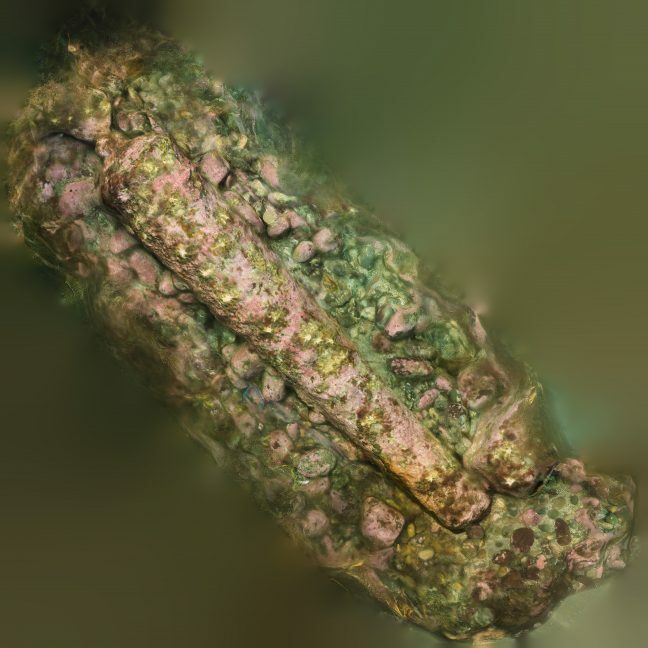 This site isn’t just for the rust lovers, but also provides for fish and flower lovers too!